Making easy and nutritious meals everyone will actually eat is an ongoing experiment in our house. As much as I’d like us all to eat the same thing for dinner, several nights a week I’ve resigned to being a short order cook. There are few exceptions, chili being one of them. This week, I’m going to post three chili recipes we like the most. First up, Pumpkin Chili, from the Thug Kitchen cookbook. Don’t let the name fool you, this meatless chili is full of flavor, and made heartier with the addition of pumpkin puree, without tasting like pumpkin. It’s super easy to make and topped with avocado and some good chips, it’s a great meal for everyone in the family. When done cooking, stir in the lime juice and serve right away. Top with your favorites and enjoy! NOTE – This makes great leftovers. After reheating the next day, add some more fresh lime juice and cilantro to make it taste just as good as the first day. I’m always looking at new cookbooks and in my dream kitchen would have a separate library (and sitting room) for them like Ina Garten. I recently discovered checking out e-books from the library, and have been looking at several I’d love to add to my permanent collection. I’m a minimalist when it comes to kitchen appliances, partly because we have a small kitchen, and mainly because the thought of more to clean after meal prep is pretty much the last thing I want to do. But cookbooks, can never have too many of those. This cookbook includes grain free and dairy free recipes for a year’s worth of holidays and seasonal celebrations – there are plenty of kid-friendly recipes, holiday sweets, and party foods like sweet and sour meatballs. It’s kind of hard to not want to make it all! There’s something about the lack of pictures and handwritten style of the recipes that’s always made this book so appealing and comforting to me. I recently made the Minestrone Soup and it couldn’t have been easier, and more delicious. The cool thing about the soups is they all were tested with water instead of stock, which makes them even easier to throw together mid-week. I was first introduced to these cookbooks from a nutritionist I worked with in college. Moosewood is a vegetarian restaurant that’s been around since 1963 in Ithaca, New York — many of the cookbook recipes are pretty easy to adapt to gluten-free and dairy-free. SIDENOTE: If you’re looking for an inspiring follow on Facebook, Mollie Katzen, is a great add! OK, I own this one, and it’s been the best cookbook I’ve read/used in a long time. Almost all the recipes have tasted great, and they’re all very easy to put together. I discovered her through some rabbit hole I was down on Instagram one day, and I’m glad I found her. My favorite recipes are the Chicken Shawarma, Slow Cooker Burrito Bowl Chicken, and Chocolate Zucchini brownies. The main reason I’ve never like cooking chicken is because I’m horrible at it…until this cookbook. The two chicken recipes I’ve tried have resulted in perfectly cooked chicken almost every time. Many recipes also feature tips to accommodate dietary restrictions. Her website is awesome too, and every week she writes a Dinner Planner for the week. Her approach has helped me cut down on our food budget, find recipes our whole family can enjoy, and inspire me to try new ways to be organized about the week. DREAM = taking one of her LA-based cooking classes. I found this cookbook while searching library books, and it’s such a cool format – organized by Season, and every recipe includes a way to adapt it for a baby to enjoy as well. What a great way to make meal prep easier! We’ve tried the Autumn Meatballs and Butternut Squash Casserole – both were delicious! I adapted both for gluten free, dairy free – they weren’t perfect when tweaked, but the flavors were incredible; especially, the Butternut Squash Casserole. I love her earlier cookbook Small Victories for its easy recipes and ways to alter them to be even simpler than they start, not to mention most of the dishes include basic ingredients. 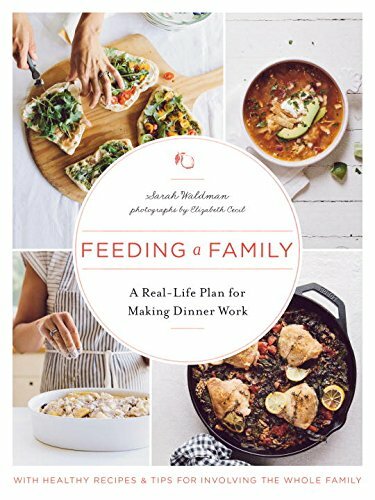 I keep seeing this new cookbook of hers pop up in my feeds, and I’m so curious about the recipes and the content – from what I can tell it seems like an all around inspiring win. One of the best cookbooks out there because the recipes are easy and contrary to the title, you don’t have to own a slow cooker to make the recipes. Within the first few pages, she includes a chart of how to make all slow cooker recipes on the stovetop or with a dutch oven. We’ve had the Chicken Pumpkin Chili, Taco Chili and Teriyaki Chicken (adapted with Coconut Aminos). All are really delicious, super easy, and feel like an indulgence without splurging. Though I’ve yet to own this cookbook, I’ve looked through it at the bookstore and it has beautiful pictures and the format is easy to follow (even includes markings if the recipe adapts to dietary restrictions). I have her first cookbook, and this one is drastically better – the recipes are easier and more appealing. When I first started this blog, it was a way to keep myself accountable after nearing the end of a weight loss journey, I had spent nearly a year and a half on. I lost weight using Weight Watchers, and by adapting recipes I’d see on blogs and TV, with the Recipe Builder feature on the App, it was a fun way I could still enjoy “regular” food, just in a more healthful manner. In this process, I discovered I preferred meatless meals to ones with, and it was so fun to explore a whole new world of recipes. I reached my weight loss goal and shortly after, I became pregnant with my first child. In the year after he was born, we discovered he has multiple food allergies. Because I was nursing at the time, this meant my diet also had to be tweaked to accommodate him. While frustrating at first, over time, years of my own stomach problems labeled as IBS, nearly all went away. For the sake of my health and our son’s, we adapted to a kitchen free of wheat, dairy, and soy – also including anything made in facilities with these ingredients. B is now 4 years old and has a new little sister. As we’re trying to figure out her allergies, I’m back in a similar situation, accommodating my diet to help identify the culprit. I can now add nuts, eggs, corn, and a few other items to the list of foods my cooking is free of. B, can eat them, but my current list has set me on a new path, yet again, of finding some great resources to help me eat healthy, while also making meals our whole family can enjoy – what this means is I’m back to eating chicken and turkey, and very occasionally red meat (though I still don’t cook that at home). We’ve always enjoyed fish (sans shellfish), so nothing has changed there. I have found some really amazing recipes and chefs who cook pretty close to the way I am eating right now. The other fun thing is I’m finally finding a way to cut down on our weekly food costs, while still making delicious and nutritious meals. (Ask anyone who needs to be mindful of food allergies, and they’ll tell you just how costly it can be – article). All of this brings me to one of our new favorite recipes – Pepperoni Pizza Pasta. I don’t have my own picture of it because we’ve eaten it too fast, the past two times we had this. It is SO good and very easy to adapt – you can sub your favorite pasta noodles for the squash noodles, and you can leave out the pepperoni and use mushrooms and garlic instead. What really makes this taste like pizza is the tomato sauce, oregano and nutritional yeast. It’s also incredibly easy to prep the night before, so the whole meal can go from stove to table in less than 30 minutes. I keep the spiralized noodles in a large ziplock, airtight in the fridge, and get the mushrooms pre sliced. Danielle Walker is the author of this recipe, and she herself, has a wonderful blog (and cookbooks) called Against All Grain. Her recipes are super creative, and you’d hardly know they were grain free and mostly dairy free. My mom and I have looked through all three of her cookbooks and there’s enough that appeals to both of us. She even inspired me to purchase a Spiralizer , which I’m LOVING! If using pepperoni or salami, heat in a large pot (I used a enameled cast iron one like this) until crispy. Remove from pan when crisped. If making vegetarian, add mushrooms and garlic until mushrooms have reduced and are soft and you can smell the garlic. If making with pepperoni, do this step after the pepperoni has been removed. Take squash noodles and add to garlic and mushrooms. Cook for a few minutes until noodles are softened. Add tomato paste, oregano, and nutritional yeast. Heat until all combined Add salt and pepper to taste. Cook a few more minutes. Mix in pepperoni and serve warm. NOTES: To make Kosher, use Kosher salami; to make vegetarian/vegan, omit pepperoni and use double mushrooms; to make Gluten-free with out squash noodles, use your favorite brown rice noodles – we love the Tinkeyada brand. If you run out of tomato paste, your favorite tomato sauce also works fine here. Line a 4×8 loaf pan with parchment paper. On low heat, melt the coconut oil in a small saucepan. Once melted, remove from heat immediately and stir in vanilla and syrup. Stir in the tahini. Once combined, add oats and salt. Stir until all the oats are coated. Stir in the cherries. Pour mixture into loaf pan and spread evenly. If desired, sprinkle on chocolate chips, lightly pressing them in with your fingers. Put in freezer for at least 45 minutes. Cut and serve immediately. Store any leftovers, covered, in the freezer. Over the past few weeks, I’ve seen a lot of my favorite food bloggers mention a cookbook, Pulse Revolution. Curious, I looked it up on Amazon, and the Kindle version is so affordable (99 cents), I had to check it out. All of the recipes are vegetarian, with many that include options to adapt for adding meat, if you desire. I also found that while many of the recipes feature dairy, they are easy enough to adapt with non-dairy versions – like this Lentil Cream Cheese Tartines one. I used Kite Hill Plain Almond Milk Cream Cheese and the rest was same as suggested. The cookbook calls this a breakfast recipe, but we enjoyed for dinner. Honestly, it’s so good, it’d be good any time of day. I also halved the recipe, because we tend to use less cream cheese than the serving size. And, for ease of a weeknight dinner, I used canned lentils – and prepared the cream cheese mixture in the morning. In a small food processor, blend cream cheese, lentils, chives, and lemon zest. Season to taste with sea salt and pepper. Set aside. You can make in advance and refrigerate. In a small nonstick fry pan, heat over medium heat. Add a little bit of oil (about 1/2 tsp per egg). Crack the egg in the pan and cook until the whites are cooked and the yolk is just starting to get firm. Cook longer if you want a more well done egg. While the egg is cooking, toast your bread. Spread cream cheese mixture on bread and top with fried egg. Enjoy immediately. As we’ve been trying new recipes, this Creamy Butternut Squash and Lentil Taco recipe is one I’ve been meaning to try for awhile. I’ve made something similar but this recipe is definitely a turned up version – here, the roasted squash gets mixed in with some lime juice and a little vegan mayo (or canned coconut milk) to make it creamy and extra flavorful. The interesting thing about cooking the lentils with some vegetable broth, cumin, and coconut aminos (or tamari), is the aroma smelled almost identical to taco meat. This was a great dinner, and also makes a great lunch from the leftovers. Preheat the oven to 400 degrees and line a baking sheet with parchment paper. Toss the squash with 1/2 tsp of the cumin and about 1-2 tbsp of olive oil, some salt and pepper. Spread the cubes out on the baking sheet and roast them for 30-35 minutes, until they’re soft. (Don’t worry if some get extra toasty, it’ll just make the color of the mixture a little darker). Meanwhile, in a small pot, combine the lentils with enough broth to cover them and stir in the coconut aminos and remaining 2 tsp of cumin. Bring the mixture to a boil and then reduce the heat and simmer until the lentils are soft, but still a little firm, 20-25 minutes. Make sure to watch the pot and add more broth or water if needed to cover the lentils. Taste them as you go to make sure they’re not overcooked and mushy. When they’re done, drain any excess liquid that hasn’t been absorbed. Transfer the cooked squash to a food processor and add the mayo or coconut milk with the lime juice, and process until smooth. Taste and add more salt or lime juice if needed. When you’re almost ready to serve, warm the tortillas, however you usually do. Assemble the tacos: spread a layer of the creamy squash on a warm tortilla and top it with a scoop of lentils (about 2-3 tbsp). Add your favorite toppings and serve. *I usually find Just Mayo Light at Whole Foods. I also wouldn’t sub an egg-based mayo here, because I think it’ll change the texture. If not using vegan mayo, use full-fat canned coconut milk to get the right creamy texture needed. Who doesn’t like a good guacamole adaptation?! True, why mess with a good thing, but I was still curious about what adding broccoli would do, and I’m very glad I did. This is a much lighter alternative to guacamole, and it makes you feel good because there’s broccoli in it. I thought this would be a kid-friendly recipe, which it’s not completely, but if yours are willing to taste it, they may just love it (or take three bites and realize they don’t yet). It is definitely husband approved, and he thought the jalapeno would add a nice kick. Cook broccoli florets in boiling, salted water for 1 minute. Remove and place in food processor with the rest of the ingredients (except the avocado). Pulse until all chopped up. Taste, and if desired, add 1/2 avocado, up to 2 avocados total. Add salt to taste if needed. Enjoy with chips. Another great cookbook I’ve been using lately is The Dude Diet. Along with the great frittata recipe I made awhile ago, we recently made ‘Grown-up Beans on Toast.’ The recipe calls for chicken sausage, but we made without, and it still tastes great – even kid approved! It’s pretty quick to make – took about 30 minutes start to finish – and, it tastes great as leftovers too. The author says the recipe makes 2 servings, but I think it can make about 6-10 toasts, depending how much you use to top the bread. If you eat meat, go ahead and use your favorite chicken sausage. I’ll list those steps as optional below. We made ours wheat and dairy-free using gluten-free bread, and Vegan Parmesan shreds. In a medium saute pan, heat pan and add olive oil. [OPTIONAL] Saute diced chicken sausage for about 4-5 minutes, until browned. Add onion and saute until translucent, just starting to brown. Add garlic and stir until fragrant. About 30 seconds. Add dried oregano, tomato paste, salt, and paprika. Cook for a few minutes more. Add drained beans, tomatoes and water. Heat until boiling. Then, reduce the heat and cook for another 10 minutes so flavors can combine. I waited until most of the liquid had evaporated. Serve warm on toast. Top with chopped parsley and vegan parmesan. For awhile I’ve been curious about a vegan take on the classic spinach-artichoke combo. 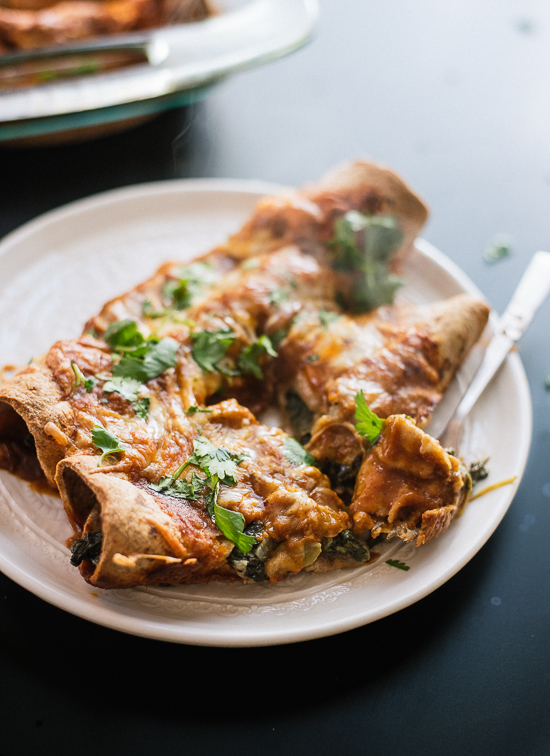 Once I found this enchilada recipe, I knew I had to make it. I wish I had my own picture of it, but we ate it too fast, so the picture from the blog where I got the recipe idea will have to do. A friend told me recently how any enchilada recipe can be made into a casserole, so I went with that, and boy was this a lot easier than rolling enchiladas! It was also great re-heated, which makes this great for a weeknight meal. I made it gluten free, using corn tortillas, and vegan using plain almond yogurt and vegan cheese, instead of sour cream and cheese. In a large skillet, heat olive oil and add onion and salt until translucent, stirring frequently, about 4-5 minutes. Add the garlic until fragrant, about 30 seconds. Add the artichokes and a few handful of spinach. Cook, stirring and tossing frequently, until the spinach has wilted. Repeat with remaining spinach. Continue cooking, stirring frequently, until the pan is no longer wet with excess moisture. Remove from heat and transfer the mixture to a bowl. Stir in the drained black beans and yogurt. Season to taste with salt and pepper. In a lightly greased 8×8 glass casserole dish, pour 1/2 cup of the enchilada sauce and make sure it covers the entire bottom. Place 4 tortillas, overlapping for the bottom layer. Put about half the spinach-artichoke + black bean mixture on top of the tortillas. Layer 4 more tortillas on top. Pour some enchilada sauce to cover tortillas and sprinkle with some of the Daiya cheese you shredded. Add the remaining spinach-artichoke+black bean mixture on top of enchilada + cheese covered tortillas. Place the remaining 4 tortillas on top of the mixture, overlapping, so it covers the entire dish. Cover with remaining enchilada sauce. Sprinkle with remaining cheese. Place in the oven uncovered for about 20-22 minutes. Enjoy! Sprinkle each serving with cilantro if you have it on hand. *I used 2 tbsp of olive oil, but it seemed like a lot, and you could easily use a bit less if you like. Because of all the spinach, I wouldn’t use less than 1 tbsp. **Kite Hill yogurt can be found at Whole Foods, Ralphs, and some Targets. I’ve also only tested this recipe with Kite Hill, and don’t know how other non-dairy yogurts would work. ***In terms of non-dairy cheeses, that also don’t contain soy, I’ve found the Daiya Cheddar Wedge, shredded at home, to melt the best, have the best texture, and taste. The pre-shredded version doesn’t always melt completely. Of course, if you can eat cheese, you can use that and traditional sour cream! This recipe is about as easy as it gets. It’s practically no-cook, but you wouldn’t know it when eating the final product. Scott was impressed with how similar the walnut and chickpea taco “meat” tasted in flavor and texture. And, for it to be a win in the texture category, is my favorite kind of vegan win. I don’t eat soy, so other meatless taco “meat” alternatives aren’t an option for us. However, I think once you make this recipe, you’ll hardly miss the other vegan options, or meat ones for that matter. TBD how this tastes the next day, but I’m guessing it’s just as great as it did tonight. Taco Tuesday, anyone? In a small food processor, combine walnuts, garbanzo beans, coconut aminos, cumin, garlic powder, and chili powder. Pulse until spices are well combined and texture is chunky (though parts may be smooth – that’s OK). Pour contents into a microwave safe bowl. In a small mixing bowl, whisk together vegan mayo and lime juice. Set aside. Prepare the tortillas and toppings. Spoon about 1 -1 1/2 tbsp of taco “meat” onto each tortilla. Top with toppings you like, and finish each taco with a drizzle of the lime aioli.